We can adjust one of our templates to better meet your needs or we can create a completely custom designed compensation statement. The cheapest and quickest options usually start from our existing templates. 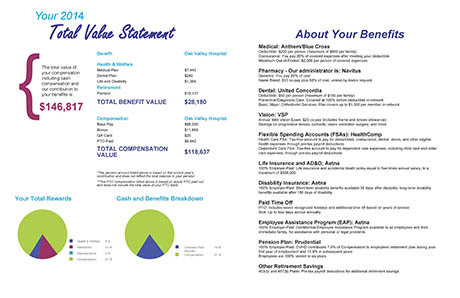 But if you want a fully-branded statement, that provides information on your unique benefit plans, we are here to help. Contact us for a quote on the initial design. We will save that layout for you so in the future you would only pay the per statement charge and for updates to the design. Many large groups choose to use the statement generator so they can preview their statements and make sure they are getting what they want and then have us run the statements rather than using the online system because of their system constraints. Either option is secure. Great news! We provide 2 hours of free programming (valued at $200) for clients with more than 500 employees. That time can be used to customize text, colors, add extra benefits, and more. Why Use Dollar Compensation Statements? Our proprietary technology allows us to produce high-quality, low-cost Total Compensation Statements. Our clients save as much as 40% off our competitors' prices for print-ready or printed and mailed statements. The impact of targeted messages delivered through personalized communications can be staggering. In fact, a year-over-year analysis by Aon Consulting found that the number of employees who were on track to retire at age 65 rose 5% if they were receiving a total reward statement with a focus on retirement-planning education.